Review: 2012-01-14, Silva vs Prater could be a three stars fight but the referee Mario Yamasaki disqualified the apparent winner for punches to the back of the head (in the first round). Erick Silva (13-1-0) entered as the No.43 welterweight in the world while Carlo Prater (29-10-1) entered as the No.49. 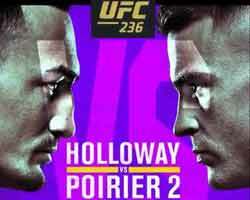 Silva vs Prater is on the undercard of Jose Aldo vs Chad Mendes (UFC 142). Watch the video! 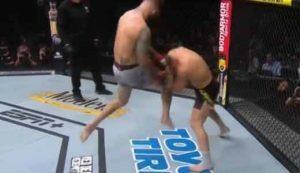 Review: 2012-01-14, pleasant fight with a good submission (UFC Submission of the Night) in the first round but it is not enough for our three stars. Rousimar Palhares, ranked as the No.15 middleweight in the world, entered the fight with a record of 13-3-0 while Mike Massenzio had a record of 13-5-0. 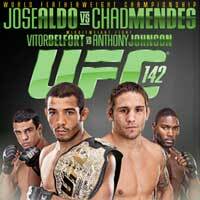 Palhares vs Massenzio is on the undercard of Jose Aldo vs Chad Mendes (UFC 142). Watch the video! Review: 2012-01-14, great fight between Jose Aldo and Chad Mendes especially for the impressive KO at the end of the first round. Jose Aldo (20-1-0) entered as the No.1 featherweight in the world while the undefeated Chad Mendes (11-0-0) entered as the No.5. 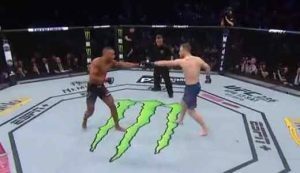 Aldo vs Mendes is valid for the UFC Featherweight Championship (main event of the UFC 142); they also faced each other a second time on October 25, 2014 (=Aldo vs Mendes 2). Watch the video! 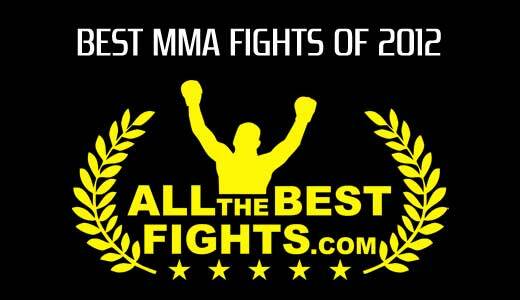 ‘Best of Mma’, is the annual ranking of the best mma fights of the year 2012 (best Ufc fights and other promotions), matches rated by AllTheBestFights. Clicking on the names of the fighters you can watch and rate the video of the fight (if it is available on the web) and read some info about it. However, you do not find a link for all the mma matches because we create a single post just for the 4 and 5 stars fights or for the most important ones. Comment this post if you want to suggest your favorite mma fight and to help us creating the best mma ranking of all the most spectacular fights! ‘Best of Boxing’, is the annual ranking of the best boxing fights of the year 2012, matches rated by AllTheBestFights. Clicking on the names of the boxers you can watch and rate the video of the fight (if it is available on the web) and read some info about it. However, you do not find a link for all the boxing matches because we create a single post just for the 4 and 5 stars fights or for the most important ones. Comment this post if you want to suggest your favorite boxing fight and to help us creating the best boxing ranking of all the most spectacular fights! ‘Best of Kickboxing’, is the annual ranking of the best kickboxing, k-1 and muay thai fights of the year 2012, matches rated by AllTheBestFights. Clicking on the names of the fighters you can watch and rate the video of the fight (if it is available on the web) and read some info about it. However, you do not find a link for all the kickboxing fights because we create a single post just for the 4 and 5 stars bouts or for the most important ones. Comment this post if you want to suggest your favorite kickboxing, k-1 or muay thai fight and to help us creating the best kickboxing ranking of all the most spectacular fights! Mma results of the world’s most important fights of the week. Week 01: (Mon-Sun) From January 02, 2012 to January 08, 2012. Boxing results of the world’s most important fights of the week. Week 01: (Mon-Sun) From January 2, 2012 to January 8, 2012.
Review: 2012-01-06, nice fight between Michael Perez and Omar Figueroa: three stars (fight ended by referee technical decision at the end of the sixth round). Both undefeated, Michael Perez entered the fight with a record of 15-0-1 (and is ranked as the No.49 lightweight in the world) while Omar Figueroa had a record of 13-0-1. Perez vs Figueroa is valid for the vacant WBO Youth lightweight title. Watch the video!